The US open is set to begin this Monday August 29th and will run until Sunday September 11th, the official draw ceremony will be on Friday, and both defending champions Novak Djokovic and Flavia Pannetta will be present. 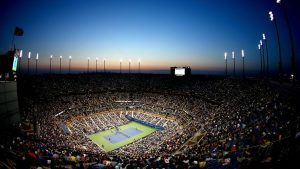 The Tournament will be showing off the new retractable roof on the Arthur Ash stadium at the Billy Jean King National Tennis Center in Flushing Meadows New York, but somethings never seem to change, for the last four years Djokovic and Serena Williams have been named the top seeds of the tournament, which makes them the favorites to win in the eyes of the organizers. After Djokovic’s history making Roland Garros win this year, he has had some very disappointing months, starting with his third round loss at Wimbledon and his first round exit at the Olympics, however for a player as mentally strong as Djokovic these set backs are more motivating than not, and he must be feeling the need to prove both to himself as well as the world that he is not quite done yet. Andy Murray on the other hand is having a great summer, he won at Wimbledon and won his second gold medal at the Olympics, so he is on a high and very much a threat to anyone in this tournament despite his loss at the Western and Southern Open. He has been named second seed which means he will not meet Novak on the court until the final if they managed to not get ousted. Rafael Nadal has already had a practice day at the US Open grounds this week, but he is exhausted from his Olympic performance where he won gold in doubles and his appearance in Cincinnati; but he said he needed to play and he does not regret his decision. He is still nursing his wrist but is in good spirits; I don’t feel he will be much of a contender in this tournament but it is always nice to see him. The other two players I feel need attention are Canadian Milos Raonic who has had a great season and could be a contender here at Flushing Meadows he was named the No. 5th seed. Rounding off my top pics is Marin Cilic, who is the number 7th seed in the tournament after defeating Andy Murray in the Western and Southern Open title match on Sunday. Of course there are other world class players to consider, among them Stan Wawrinka from Switzerland and Kei Nishikori of Japan, the number 3 and 6th seed in this tournament but I am sure the real battle will be between the number 1 and 2 seed of the tournament which happen to be the No. 1 and 2 in the world, Djokovic and Murray.